When President Barack Obama visited a fundamentalist mosque in Baltimore on Feb. 3, he flattered his Islamic audience, smiled cheerfully and then rhetorically flattened the constitutional and cultural walls that protect competing religious beliefs from the progressively expanding federal government. Robert Spencer, an expert on Islamic ideology and a best-selling author, says Obama’s condescending comments about Islam and all religions reveal his corporatist view of society, in which all elements of society — religion, industry, unions, family, education — are subordinated and coordinated by government officials. For Obama, rival churches are “just social-work centers, that’s all, he doesn’t care about the content of doctrine, and pretends they all teach the same things,” Spencer said. Obama is dismissive of rival religious groups’ sincere beliefs because “he doesn’t believe that [religious] words mean anything,” Spencer told Breitbart News. In his most patronizing passage, Obama portrayed 310 million autonomous, free and independent Americans as children under the parental supervision of Uncle Sam. “We’re one American family and when any part of our family starts to feel separate or second-class or targeted, it tears at the very fabric of our nation,” the president claimed, ignoring the nation’s long and very successful history of balancing competing ideas and varied lifestyles. 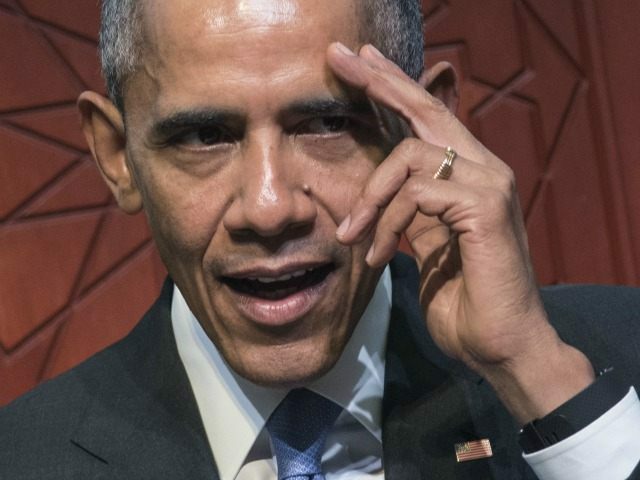 This contempt is partly offset when Obama grapples with Islam’s aggressive supremacism because he apparently has fond memories of Islamic society from his childhood in Indonesia, and because he seems to see the growing Muslim population as reinforcement for Democratic political candidates. The Muslim influx, which he has allowed to accelerate, also is a way to dilute the social and political clout of Christians who Obama said at Baltimore still “remain” the majority of Americans. Moreover, Obama has the practical problem of suppressing the reality of jihad and the public’s worry about jihad, both of which reduce his ability to solidify progressives’ domestic power in the United States. That problem leads him to both downplay the danger and destruction of jihad, and also to appease jihadists and their political brothers, the Islamists, so they turn their attention elsewhere. “The future must not belong to those who slander the prophet of Islam,” Obama told the world in September 2012, shortly after Islamists in Egypt and Libya attacked U.S. diplomatic facilities in Cairo and Benghazi. But Obama’s overall approach to Islam seems powered by progressive contempt for all religions, not by actual respect for Islam and its doctrines. “So let’s start with this fact. For more than 1,000 years, people have been drawn to Islam’s message of peace. And the very word itself Islam comes from salam, peace,” he declared. No, it does not. In fact, Islamic websites and major dictionaries almost uniformly say “Islam” means “surrender” or “submission” to Allah, but not peace. “Origin of islam Arabic islām submission (to the will of God)” says Merriam-Webster. The word Islam derives from the Arabic triconsonantal root sīn-lām-mīm (SLM [ س ل م ]). Many different words are created from this root word by inserting different vowels between the three root consonants. Many English speakers wrongly assume that if two Arabic words share the same root word then their meanings are related when in reality the fact that some words share the same root word does not imply a relationship between the meanings of the words… Many people have wrongly attempted to equate the word Islam with peace by showing that Islam, meaning ‘submission’, shares a root word with Salaam, meaning ‘peace’. But if such relationships between the meanings of Arabic words can be created then that would imply that there is a relationship between one of the derivations of the infinitive Salama, meaning the stinging of the snake or tanning the leather, and Salam, meaning peace; a relationship which obviously does not exist. Next, Obama casually rewrote a classic Koranic threat against Jews into a 1970s-style inspirational poster. “The Koran says whoever kills an innocent, it is as if he has killed all mankind,” Obama declared, without any nod to the fact that orthodox Islam views the Koran as a perfectly transcribed copy of Allah’s unchangeable and perfect commandments to his prophet, Muhammad. Obama’s new and improved Koranic passage is extracted from Verse 32 of Book 5 of the Koran, said Spencer. “There’s no doubt where that comes from,” Spencer said, partly because the 5:32 verse is selectively cited by many Islamic advocates, nearly all of whom ignore the more-threatening subsequent verse. The real 5:32 verse is not a promise of peace, but an Islamic threat against Jews, who are dubbed the “people of Israel” in the Koran, Spencer said. “This is a statement specifically directed to the Jews and not Muslims…. it is a threat, it is saying ‘[Allah] told you not to kill, but you kept killing,’” Spencer said. Obama next declared that Islam promotes understanding between different cultures. “’Oh, mankind,’ the Koran teaches, ‘We have made you peoples and tribes that you may know one another,’” declared Obama. In fact, the next sentence in that 49:13 verse says Allah believes that observant Muslims are superior to other people. “O mankind, We have created you male and female, and appointed you races and tribes, that you may know one another. Surely the noblest among you in the sight of God is the most godfearing of you. God is All-knowing, All-aware,” says the Arberry translation of the verse. We all have responsibilities. So, with the time I have left, I just want to suggest a few principles that I believe can guide us. First, at a time when others are trying to divide us along lines of religion or sect, we have to reaffirm that most fundamental of truths — we are all God’s children. We’re all born equal, with inherent dignity… So, all of us have the task of expressing our religious faith in a way that seeks to build bridges rather than to divide… when any religious group is targeted, we all have a responsibility to speak up and we have to reject politics that seeks to manipulate prejudice or bias and targets people because of religion… faith leaders, including Muslims, must speak out when Christians are persecuted around the world … none of us can be silent, we can’t be bystanders to bigotry. Spender scoffed. “To say, ‘To attack one religion is to attack all religions’ is one of the most ludicrous things I’ve heard — it is like saying, ‘To invade one country is to invade all countries,’” Spencer said. Also, if Americans don’t follow Obama’s speech commandment, “What’s he going to do? Is he going to destroy the First Amendment to prevent insult to Islam?” Spencer continued. “The president of the United States ought to be saying ‘We have to allow politicians to insult Muslims and anyone else they want to insult’… any restrictions on Freedom of Speech is a step on the road to tyranny,” Spencer said. Obama is unwilling to treat rival religions as separate and competing belief-systems because “he assumes they all teach the same things,” Spencer said. And those same things add up to a God-tinted variety of community organizing that is free of any significant religious belief, according to Obama’s speech. Now, a lot of Americans have never visited a mosque, and to the folks watching this today who haven’t, think of your own church or synagogue or temple and a mosque like this will be very familiar. This is where families come to worship and express their love for God and for each other. There’s a school where teachers open young minds, kids play baseball and football and basketball, boys and girls. I hear they’re pretty good. Cub Scouts, Girl Scouts meet and recite the pledge of allegiance here. With interfaith dialogues, you build bridges of understanding with other faith communities, Christians and Jews. There’s a health clinic that serves the needy regardless of their faith. And members of this community are out in the broader community working for social justice and urban development. As voters, you come here to meet candidates. As one of your members said, just look at the way we live, we are true Americans. So the first thing I want to say is two words that Muslim-Americans don’t hear often enough, and that is thank you. Thank you for serving your community. Thank you for lifting up the lives of your neighbors and for helping keep us strong and united as one American family. Understand your power to bring about change. Stay engaged in your community. Help move our country forward, your country forward. Obama did offer some lip-service to “freedom of religion,” but he was careful not to describe it as freedom from government directives, or even the freedom to oppose presidential mandates. Instead, he characterized freedom of religion as the opposite of the formally theocratic states operating in the Middle East. That’s just a straw-man argument that allows him to view religion as still free of government even if it is operating under rules set in a presidential speech at a Baltimore mosque. As Americans, we have to stay true to our core values and that includes freedom of religion for all faiths. I already mentioned our founders, like Jefferson knew that religious liberty is essential not only to protect religion, but because religion helps strengthen our nation. If it is free, if it is not an extension of the state. Part of what has happened in the Middle East, and in North Africa and other places where we see sectarian violence is religion being a tool for another agenda — for power, for control. Freedom of religion helps prevent that, both ways. Protects religious faith, protects the state from — or those who want to take over the state from using religious animosity as a tool for their own ends. responsibilities… have to reaffirm… have the task of expressing our religious faith in a way that seeks to build bridges rather than to divide… have a responsibility to speak up… to reject politics that seeks to manipulate prejudice… must speak out… none of us can be silent, we can’t be bystanders. But Obama is much more parochial than the bombastic Mussolini, who tried to rebuild ancient Rome’s empire in northern Africa. Obama thinks he can draw Islam into the Democratic coalition for 2016, 2018, and every other election year — while he also expects Islam’s crude 1,200-year-old Arab doctrines to melt away like snow on a sunny day, leaving harmless Muslim-colored diversity in many U.S. upscale communities in a decade or two. But Islam’s “jihad” holy war; “dhimmi” religious apartheid; acceptance of slavery; subordination of shrouded women; contempt for gays; exclusion of people from visual arts; rejection of reason and science; and belief in sharia and the caliphate which binds religion, society, law and the state — have survived for more than 1,200 years. The doctrines are going to survive Obama’s faculty-lounge contempt, and they’re increasingly visible in New York and Paris, San Bernardino, London and Rotherham, Baltimore, Chattanooga, Fort Hood, Malmo, Dublin, Brussels, and Cologne.